A unique opportunity to acquire a beautifully restored 16th century nobleman’s house in the Loire valley. The property comprises the main house, with its hexagonal tower, walled gardens and outbuildings which together make up a whole block in the centre of a medieval walled town ten miles south of Saumur. There are currently six apartments, the owners’ ground-floor accommodation and five further luxury apartments that are let to discerning holidaymakers. As well as the large garden there is a swimming pool with its outbuildings, a room currently used as a games room, covered parking for the owners’ cars, a laundry for guests’ use, a workshop and ample courtyard parking. Roof space in the main house could be transformed into split-level studio accommodation. However, for someone with another project in mind, La Maison Aubelle could be easily transformed into a boutique hotel, a restaurant with rooms, or simply a fabulous family home. There is ample room for further expansion in an adjoining property, which has been externally restored and supplied with all mains services, particularly suitable for lucrative bed and breakfast accommodation, which is much sought after in the area. Building consent has been granted to use part of this building as a commercial space, particularly interesting as it is opposite the Office de Tourisme. 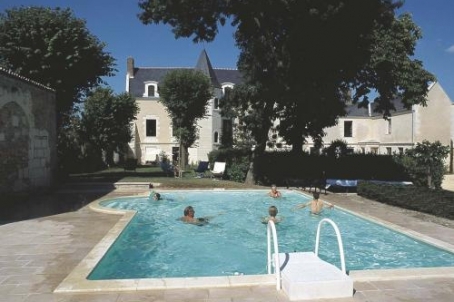 La Maison Aubelle opened its doors to guests in 2000 and welcomes holidaymakers, mostly English speaking, including regular visitors from as far afield as Canada, southern Africa and Australia. Not only do they enjoy the unrivalled comfort of their 4-star accommodation, unique in this area, but also getting together for table d’hôte dinner in the evening, either in the glowing stone dining room or on the terrace. The high number of repeat reservations indicates how successful this formula has proved.